It is March 19th, spring 2018 begins tomorrow in the state of Minnesota, the popularization place of inline skating. Here in Minnesota, when Rollerblade started its mass marketing and subsequent mass proliferation of inline skates in the late 80’s, early 90’s, many new inline skaters skated off into the great outdoors, outside the comforts of a familiar controlled flat rink setting. New in their midst were hills, tight corners near busy motorized and non-motorized traffic, uneven broken terrain, sticks, twigs, sand, pebbles, wooden bridges, and, but not limited to, unleashed dogs requiring unique skating negotiation skills. No inline skate instruction was available at the time. Brand new skaters were left to their own devices to survive, even experienced ice/roller skaters of all disciplines, drawn to the new outdoor activity, found skating outside required an entirely different set of skating skills to ward off injuries. No matter the level of competency, indoor skating skills were insufficient to prevent injuries skating outdoors. learning how to use the heel brake. The major skate manufacturer suffered lawsuits as a consequence of rollerblading injuries. They started selling volleyball knee pads and other inadequate, but useful protective equipment to help mitigate injuries. Many skaters sought console by leaving their new inline skates in the closet, left to collect dust, classifying the sport as “dangerous”. Without qualified lessons, skating can be hazardous. However, with lessons specific to outdoor inline skating, like other sports, risk of injuries can be calculated and significantly reduced. Having a background in competitive roller skating, and living in the popularization place of “rollerblading”, Robichon’s Skate Ventures recognized a dire need for outdoor skate instruction and started creating curricula, and new ‘outdoor’ skating skills to keep skaters safer while skating outside. 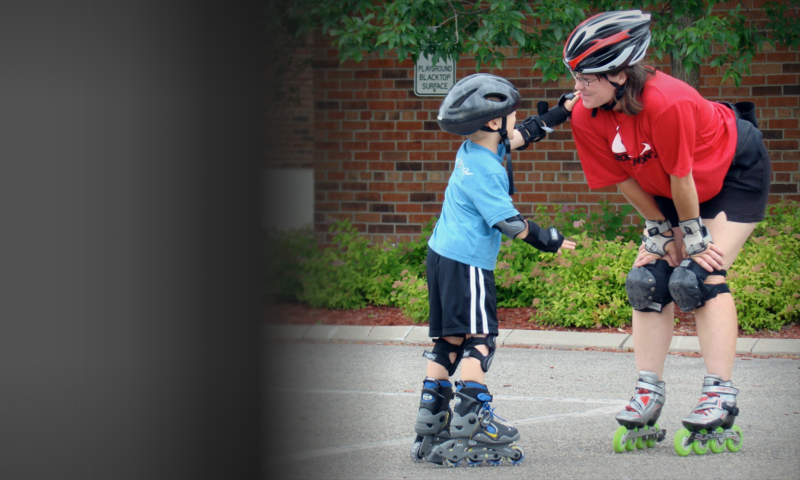 While skating outdoors is not without inherent risk, professional inline skate lessons are a key component to keeping you safe on inline skates, outdoors. People simply need to be aware professional inline skate lessons are available. To alert others inline skate lessons are available to reduce potential injuries, please share our skate school far and wide. After learning to skate from asphalt to grass, down hills, then grass to asphalt, the kids could not resist the grassy hill. *side note: There are many reasons to take an outdoor inline skate lesson. Click why to take a lesson to learn more.